Tomorrow is our last day of Zoo Week and I think we might have more activities than days to share them with you. We have been having so much fun creating with this theme. There are so many cool animals to explore. 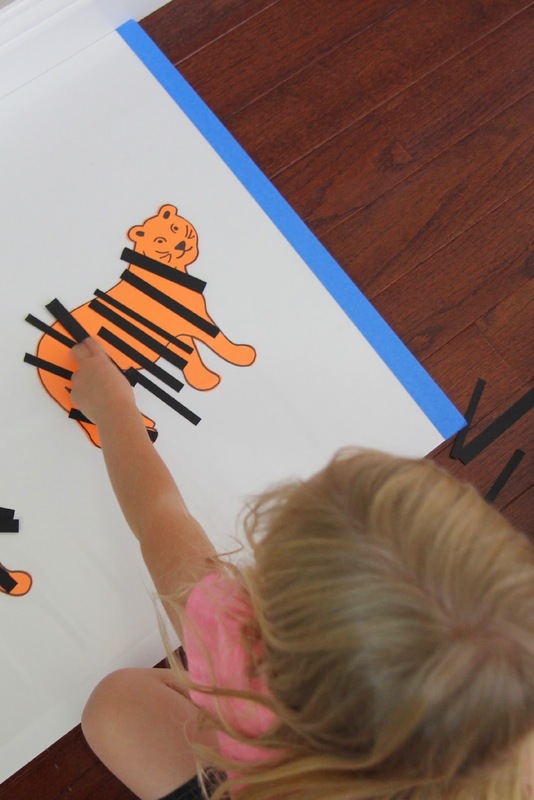 Yesterday we shared our Zoo Animal Peek-a-Boo board and today we did a sticky tiger craft! We love sticky walls and sticky tables. This activity can be used as either. The main material you need to make this activity sticky is CONTACT PAPER. If you don't have a roll of clear contact paper (or clear shelf liner) on hand, go buy some! 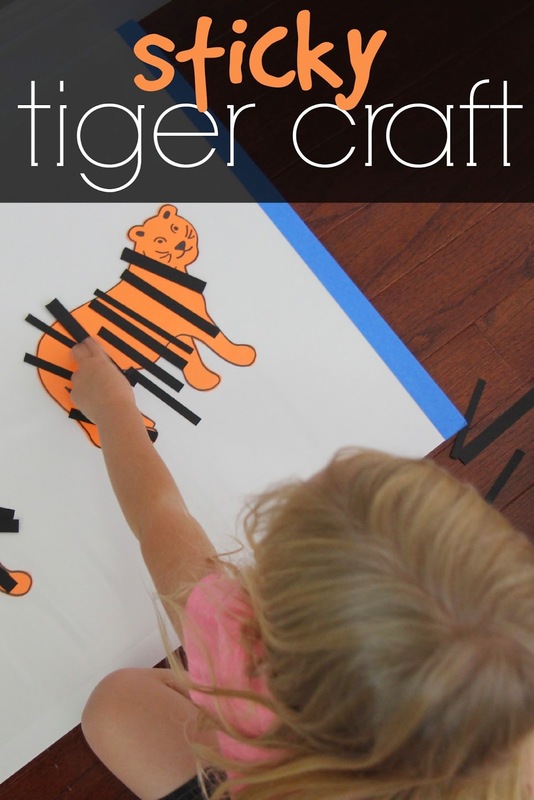 This sticky tiger craft can be modified in a variety of ways for different ages of kids. To make the sticky tiger you need to start by printing off our tiger printable onto orange paper. Next you'll want to cut the tiger out and stick it to a board or wall. After it is stuck to the board/wall, add some contact paper on top of the tiger picture, sticky side up!! Use painter's tape to hold the contact paper in place. When you touch the board it should be sticky! Next you'll want to cut up some black strips of paper. This is a perfect activity for kids who are learning how to cut. If your kids aren't ready for cutting yet, cut the strips into varied sized pieces for them. After your strips are cut, you are ready to start creating your sticky tiger craft!! Give your kids some black paper strips and put the sticky board against the wall or put it on the ground. My youngest son (20 months) loved making tiger sounds while he was creating! Some kids will just pile the strips all over one spot, some will spread them out. It doesn't matter what they do as long as they are having fun creating! For older kids they can cut their own strips and then cut them to different sizes to make the tiger stripes look exactly how they want... as in the example below. Have you read any tiger themed books lately or done any tiger crafts? 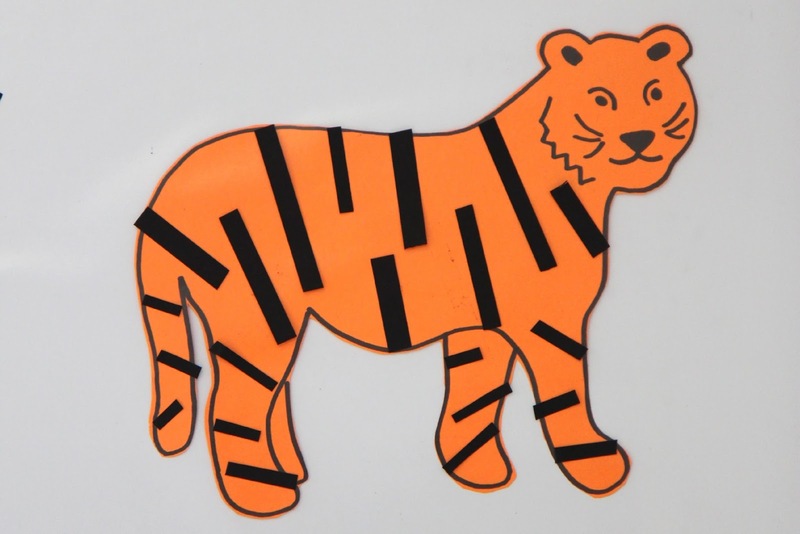 We think this Tiger paper bag puppet from No Time for Flashcards is pretty cute. Head on over to our Zoo Week landing page to see the other activities as we share them this week. You can also follow my Going to the Zoo pinterest board for more ideas too.